Mostly sunny. High 69F. 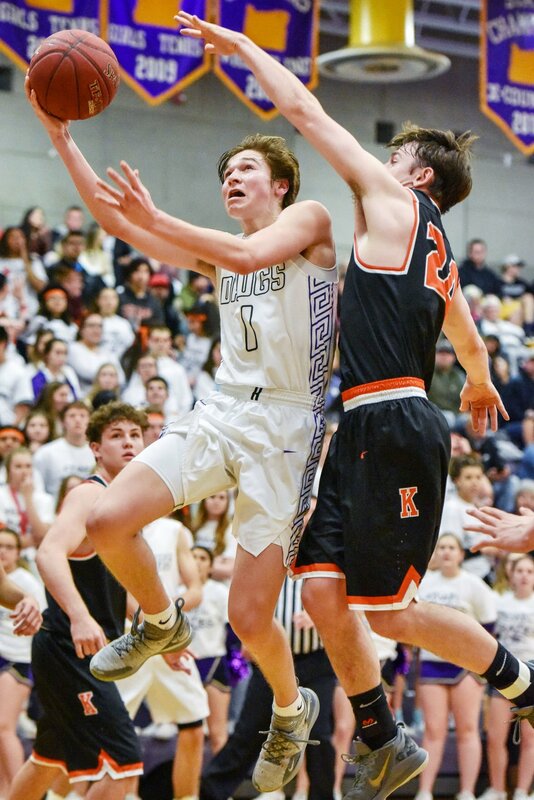 Winds WSW at 10 to 20 mph..
Hermiston’s Ryne Andreason shoots the ball guarded by Kennewick’s Tyler Pearson in the Bulldogs’ 86-75 loss to the Lions on Friday in Hermiston. Hermiston’s Cesar Ortiz (3) and Ryne Andreason go up for a rebound surrounded by Kennewick defenders in the Bulldogs’ 86-75 loss to the Lions on Friday in Hermiston. Hermiston’s Andrew James drives on Kennewick’s Blaine Chavez in the Bulldogs’ 86-75 loss to the Lions on Friday in Hermiston. Hermiston’s Jordan Ramirez shoots the ball over Kennewick’s Baiden McElroy in the Bulldogs’ 86-75 loss to the Lions on Friday in Hermiston. Hermiston’s Jordan Ramirez, left, and Ryne Andreason attempt to steal the ball from Kennewick’s Myles Mayovsky in the Bulldogs’ 86-75 loss to the Lions on Friday in Hermiston. 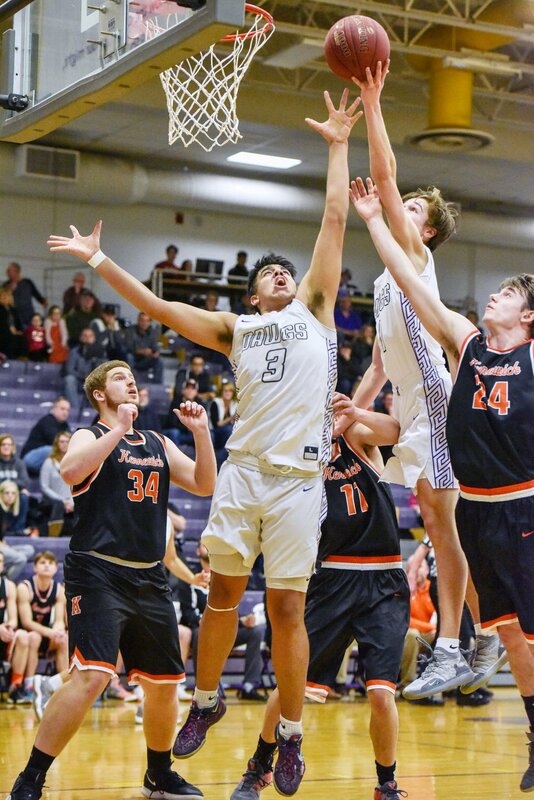 Hermiston and Kennewick had a little rust in their games Friday night, but it would be the Lions who got their act together first in the District 8 semifinal game at the Dawg House. Tyler Pearson hit eight 3-pointers and finished with 26 points to lead Kennewick to an 86-75 victory over the Bulldogs and into the championship game. The Bulldogs now will host Kamiakin at 5 p.m. Saturday in a loser-out game. Kennewick advances to the title game against Mt. Spokane, which beat Shadle Park 73-55 in the other semifinal game. The championship game will be played at 4:30 p.m. Saturday at Spokane Arena. “The championship game is all right with us,” Kennewick coach Bradyn Leyde said. Friday’s game, which was rescheduled four times because of inclement weather, was close in the first quarter, and tied at 6-6 midway through. The Lions would lead 14-9 by the end, going on an 8-3 run the final 3:11. Kennewick hit five 3-pointers in the second to extend its lead to 39-20. At the other end, the Lions shut down the Bulldogs’ perimeter game, allowing just one 3 by Cesar Ortiz in the first half. The Lions led by 22 — 46-24 — early in the third period, but the Bulldogs did not fold. Ortiz scored 13 of his game-high 28 points in the third quarter to help pull the Bulldogs within 48-38 with 3:08 remaining in the quarter. Kennewick would drain a couple of 3s down the stretch for a 58-41 lead with one quarter to play. Andreason scored 21 of his 27 points in the fourth quarter for the Bulldogs, who were within 10 of the Lions seven times in the final quarter. Hermiston trimmed the deficit to 83-75 with a pair of free throws by Andreason, but there were only 13 seconds left in the game. Ayoni Benevidez added 19 points for the Lions, while Blaine Chavez chipped in 12. KENNEWICK — Benavidez 19, Chavez 12, Simmons-Dumo 6, Collier 5, Mayovsky 5, Pearson 26, Childs 5, McElroy 8. HERMISTON — Andreason 27, Ortiz 28, James 5, Madrigal 3, Ramirez 9, Mendez 3.